Many boaters would certainly agree that one of the most character building situations in recreational boating is dealing with an engine that has slipped its mount and needs recovery from the deep. The process for salvaging an engine and the efforts involved in getting it running again (also known as pickling an engine) make tremendous sea stories. It also provides several lessons for those who have not yet had the experience — or suffered the embarrassment — of retrieving and restarting a drowned engine. The following tips will serve as a general guideline for fixing a drowned outboard engine. The very first place boaters should seek information regarding drowned engines is the owner’s manual. Manuals provide specifications describing engine weight, fuel, fluid types, quantities, and more. The manuals may also identify the location of engine lift points (for use during engine retrieval) and steps for cleaning and restarting submerged engines specific to the engine make and model. A logical next step would be to review the boat insurance policy to determine if coverage for expenses involved in retrieving and restoring a submerged engine might be available. The challenges associated with raising an engine multiply exponentially as the water depth above the engine increases. Another critical factor is the engine weight itself, so consider both factors when planning retrieval. For example, a four-stroke, 150 HP engine weighs over 450 pounds, not counting the water that has seeped inside. Fortunately, dinghy or auxiliary sailboat engines are typically much lighter, in the 70-200 pound range, depending on horsepower. Modern engines are packed with electronic equipment to monitor and control fuel use, temperature, and more, and to provide periodic engine diagnostics. 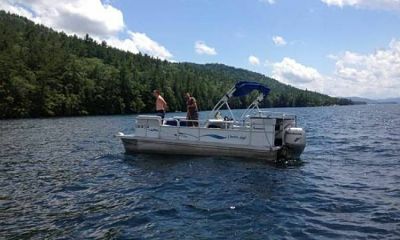 As this gear can be sensitive and typically not waterproof, boaters can expect to replace the electronics inside a submerged engine. While it may seem counterintuitive, the best approach to retrieving an engine may be to leave it submerged until the proper salvage equipment and human assistance, as well as an adequate work space, and the necessary tools/supplies are available. Consequences are dependent upon whether the engine is submerged in saltwater or freshwater. Engines and engine components submerged in saltwater will experience much more corrosion and electrolysis when exposed to air than engines sitting in freshwater. Beginning the cleaning, draining, drying, lubrication, and testing processes immediately after retrieval affords the best chance for a successful rescue and minimizes the corrosion that will occur when the engine becomes exposed to air. Knowing whether the engine was running or not when it went under is critical. If not running, the engine has basically remained sealed and will most likely live to run again with some cleaning and comparatively little maintenance. Conversely, an engine that was running when it submerged has ingested water into the cylinder head and other interior parts, which will likely require extensive maintenance. Once the engine is out of the water, perform work in an open, airy location and properly mount it in an upright position. Also, remember that it will be necessary to tip the engine on its side enough to thoroughly drain water from the inner engine parts. Have buckets, mops, rags, and absorbent material (sand or kitty litter) readily accessible to control fuel, water, and lube spills and leaks. A fire extinguisher at hand is also a good idea. Before beginning the engine cleaning, draining, and restart process, assemble the necessary tools (spark plug wrench, screwdriver, etc. ), fluids (fuel, oil, starting spray, spray lubricant, etc. ), hose, and an adequate supply of fresh water. If do-it-yourself efforts to clean and restart the engine are unsuccessful, involving a professional outboard engine mechanic would be a prudent course to take, especially a mechanic who is qualified on the make and type of the submerged engine. The mechanic can focus specific product knowledge and experience on the problem and utilize tools and diagnostic equipment to provide a solid, fact-based prognosis about the chances of saving the engine. Likewise, a marina or outboard engine repair shop would likely have a test tank or at least a 55-gallon drum in which to test an engine after recovery and cleaning. As a first step, remove weeds, mud, silt, or sand from the engine exterior and thoroughly clean with a mild detergent, then rinse with freshwater and a hose. Remove the engine cowling and rinse exposed interior parts. Drain any remaining fuel into a bucket. Loosen and remove the fuel line, pull the line off the carburetor, and drain any remaining fuel into a bucket. Remove the spark plug(s) with a spark plug wrench. Tilt the motor so that the spark plug hole(s) face downward. Hand-crank the engine to purge water out of the cylinder. A grinding noise may indicate sand is present inside the cylinder head. If so, stop cranking immediately and solicit the help of a qualified professional to do an engine overhaul. To absorb water in the cylinder head, pour methyl alcohol (common in gas line anti-freeze) into the cylinder head through the spark plug hole. When complete, flush the water and fluid out of the cylinder head into a bucket. Use a spray lube to liberally coat the cylinder interior and the carburetor air intake while hand-cranking. This will purge any water lodged in the carburetor jets. Reassemble removed parts and mount the engine on a 55-gallon metal drum filled with water or find a test tank. Attach the engine fuel line to a tank of fresh gas and prime as normal. Start the engine and, if needed, spray starting fluid directly into the cylinder through the spark plug hole. Allow the engine to run for at least 30 minutes. Once running, gas flow through the carburetor and the cylinder will remove remaining water and engine heat will evaporate water that has settled on electrical parts. As with engines that have been running, first remove weeds, mud, silt, or sand from the engine exterior and thoroughly clean with a mild detergent, then rinse with freshwater. Spray starting fluid into the air intake and start the engine; once running, allow it to run for at least 30 minutes to purge water from the carburetor or cylinder head. If the engine does not run after following these procedures, seek the advice and involvement of a professional outboard mechanic. Salvaging an engine and getting it running again happens more frequently than boaters might admit. Understanding the basics of submerged engine retrieval and restarting, particularly with modern engines, can make the experience much less challenging and more straightforward.